Q: Does Lureen lie to Ennis on the phone? Q: What is the last line of the film? What does it mean? Q: When Ennis and Alma were in bed, was Alma telling Ennis he didn't spend enough time with his daughters or that she wanted a divorce? I didn't believe for a moment that the film could live up to the hype, or to some of the comments posted here, some of them read like love letters to the film, to the director and the actors. Well, now, after seeing the film, I feel like writing a love letter myself. The film took over my senses and transported me. The tragedy that envelopes the lives of Ennis and Jack is caused by an ancestral ignorance that is part of our DNA and if you don't believe me read some of the hateful comments posted here alongside the love letters. That's the heart of the matter. 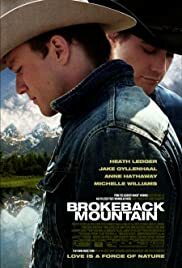 After the summer in Brokeback Mountain, Ennis and Jack go their separate ways and Ennis hits a wall with his fists crying, trying to destroy his longing, self loathing, guilt, horror. Imagine in a world without ignorance and therefore without hatred, Ennis and Jack could have celebrated their love and attempt an honest life together. Imagine also if things were the other way and heterosexuals were the dark minority, imagine falling in love with a girl and having to keep it secret, never been able to tell or to show publicly your love for her. Men like Ennis, and there are many, have to curve their own emotions and conform, entering and developing unhappy marriages and why? Read some of the comments here and you'll understand why. There is one that condemns the movie and what the movie may do for his kid and his vision of cowboys without actually having seen the movie! That's the heart of the matter. I will go and see the film again tomorrow, if I can get tickets, I'm taking with me a group of people that hate the movie already without having seen it. I won a bet so they will have to. I'm taking them to diner later to talk. I intend to report the results if you let me. 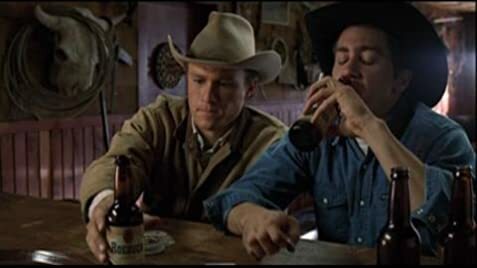 But for the time being let me tell you, "Brokeback Mountain" is an extraordinary film. Jake Gyllenhaal, Ann Hathaway and the magnificent Michelle Williams give superb performances but it's Heath Ledger's film. He gives us something that nobody could possibly have expected because what he gives us is not only, honest and moving and powerful but totally and utterly new. 970 of 1,132 people found this review helpful. Was this review helpful to you?